Dr Githaiga has a background in Veterinary Medicine and Msc in Epidemiology and economics and an MA in Leadership and is a certified life Coach. He has over 18 years’ experience in programming in various sectors including Wildlife Conservation, Public Health and livelihoods in Africa. Dr. Githaiga is passionate about Community social and economic empowerment at the grassroots level with a deep belief in sustainable livelihoods through business development. Dr Githaiga has worked on agricultural and business value chains at the bottom of the pyramid, translating theory into practice with the most marginalized and livelihood challenged communities including refugees, pastoralist communities, the urban poor and the youth demography. 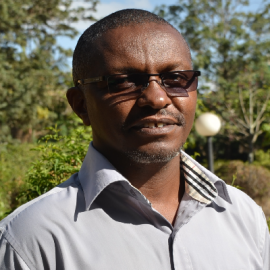 Dr. Githaiga is a gifted trainer and motivational speaker and has developed training programs targeting the youth and women in the fringes of society including street families, substance addicts, illiterate pastoralist women and youth and refugees.